Among school-related factors, school leadership is second only to teaching in its potential influence on student learning. 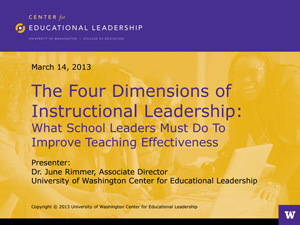 Instructional leadership is a critical aspect of school leadership. The work of instructional leaders is to ensure that teachers have the knowledge and skills necessary to ensure that every student receives the highest quality instruction each day. In this webinar, discover a new instructional leadership framework that will help school leaders improve the quality of teaching and learning for all students. Vision, Mission and Culture Building. Management of People and Processes. Dr. June Rimmer joined CEL in 2011 as an associate director. In this role she develops and manages district partnerships committed to building leaders’ expertise in instructional leadership and to transforming central office. Prior to joining the CEL team, June served in numerous leadership roles in urban education settings most recently as chief academic officer in Seattle. Before coming to CEL, she served as a program director with the Stupski Foundation in San Francisco coaching and providing technical assistance to urban district leaders committed to reform. In addition she was part of a research team examining powerful student learning experiences that lead to 21st century skills and competence as well the system-level change needed at both the district and state levels to support 21st century learning. June’s professional interests lie in the design of equity-based instructional systems and building expertise in educators’ practice to ensure that all students, particularly our most vulnerable children, exit our systems able to thrive in our dynamic, interconnected, global community.